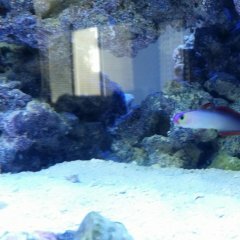 I am new to saltwater fish keeping. I was wondering if anyone could give insight into my hypothetically set up. I have a 28 gallon 21"L x 18"W x 20"H tank. Lots of info on normal sized aquariums but lots of conflicting information on hexagon fish capacity. I am going to run a marineland penguin 350 power filter, rio nano protein skimmer, hydor koralia nano 240 gph circulation pump. I am unsure as to what size heater I need? I am thinking of doing a reef tank with 15 pounds live rock. I was wondering if i could house 2 Ocellaris Clownfish, 1 neon blue goby, and 1 orange Striped Prawn Goby. Crustacean and Mollusk wise I am thinking of 1 Maxima Clam, 3 Banded Trochus Snails, 2 Scarlet Reef Hermit Crabs, and 1 Pacific Clown Anemone Shrimp. 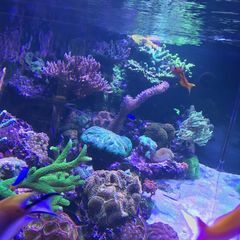 I am thinking about the following corals/plants: 1 Bubble Tip Anemone(higher in the water column on one side),1 Toadstool Mushroom Leather Coral(also higher up in the water column on the opposing side), 2 Candy Cane Corals (starting from each side of the live rock toward the bottom of the tank). Any help or advice would be greatly appreciated. All of the livestock you have in mind is definitely doable, but I would advise against an anemone, and suggest waiting a long time until your system matures before trying to keep a clam. Anemones are not easy to place in a tank, they can migrate around a tank after previously settling, disrupting a mixed reef. To avoid heartache, I would choose something else. Torch coral, frogspawn, or hammer coral can offer similar characteristics, and clownfish will sometimes host in them. Those are classified as large polyp stony corals (LPS), like the candy cane coral you are interested in. Have you had the hexagon tank for awhile or is it new? These tanks have earned a reputation for springing leaks as they age, in the past, but I'm not sure what the latest consensus is. The 20" depth of the tank might make it more difficult to light, light output is reduced the further it travels, something to consider as well, but not impossible to overcome with a more powerful light. Don't let me fully discourage you, just things to consider before moving forward! The Marineland Penguin Power Filter could work as a mechanical filter, a place to put carbon or other media. I would remove the biowheel though, your live rock will handle the biological filtration for your nano reef. An AquaClear hang on back filter might serve you better, if you don't yet have the Marineland filter. Is your background in freshwater aquariums? I don't see a problem with the livestock you posted for that tank (well maybe the clam). Some things, like the anemone, will appreciate a more mature aquarium, so you wouldn't necessarily want to add everything all at once. Edit: Chris offered some good advice. An LED light might be appropriate for a deeper tank with less surface area. I had a freshwater tank along time ago, but have been more into plants the last five years or so. Just recently moved into an apartment without a garden and have always wanted to get into saltwater. I have a variety of LEDs and high compact fluorescents from my growing days, so I'm not too worried about the light even with the depth. 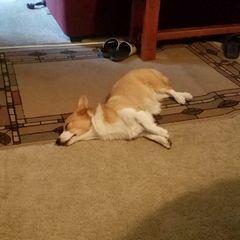 I just purchased the 28 gallon hexagon on Monday because of space in my apartment and it was a steal at 85 dollars from petsmart, normally it's about 275. If I didn't go with the clam could I do another two to 3 inch fish or is this pushing the limits of the tank? If so, what would you suggest? Based on what I've read I'm going to cycle the tank for the next 6 weeks, add live rock, 2 weeks later add the coral, then 2 weeks later add the fish? For the longest time I kept two clownfish and a Benny in a 100 gallon tank. So I tend to "understock" if that's even a thing. I think you could probably get by with another nano fish (providing it's compatible, and doesn't compete for the limited swimming space of a hex tank). It might also increase the maintenance requirements. The spectrum of your plant growing lights might favor algae growth over coral growth. Thank you Seabass. Yeah I'll have to do more research regarding how corals photosynthesize verses algae photosynthesis. I know the LEDs have both blue and red spectrum lighting, but the compact fluorescents are mostly blue. How strong of a light does coral need? I have fixtures of both starting at 50 watts up to 300 watts-viparspectra 300. It's not done much today; but back in the day, we used to use watts per gallon guidelines. "To correctly light a reef aquarium that is 24" deep or less, use a lighting system between 4 to 8 watts per gallon. Of course, you can relax requirements significantly by choosing to house only corals and invertebrates that require low levels of light, as well as non-photosynthetic invertebrates." For compact fluorescent, you'd typically have a mix of 10,000K and actinic bulbs. Red lights would probably invite more algae growth. Can I use a combination of lighting from different sides? The top doesnt have a lot of surface/ area space. Could I run a compact florescent strip on both sides or would that be too bright for the fish? I know from reading a book on clownfish breeding, that clownfish fry should have light coming from the top, and not the sides (due to them hunting rotifers). But, TBH, I'm not sure how it might affect your fish. It might not be the most natural way to view your tank either. I'd probably recommend an Aqua Illumination Prime HD. But since I don't know what you currently have, I'm not sure how suitable any of your fixtures might be. I've purchased a macegrow Led Aquarium Light-Aqua Knight 30W Touch Control Aquarium. More I read though it seems this won't be enough light for coral growth. I need about 70 more watts of power based on my tank size from your recommendation. Well the AI Prime HD that I recommended is only a 55W LED fixture; but yeah, that 30W macegrow fixture is a little weak. There are relatively cheap Chinese LED boxes available that would also work. You could give that macegrow a try, but I'd probably forget about getting a clam or a BTA. Hi Seabass, thank you for your input. Could you give me your opinion HIPARGERO LED Aquarium Light - LED Aquarium Lights 65W Saltwater Lighting with RF Remote Control and 3W/5W Cree Chips for 12-24 Inch for Coral Reef Fish Marine Tank. I bought the 30watt at a really good price so it's really not worth returning. Could the above light be enough between the two for the clam and BTA? Also I've gotten feed back that the penguin filter isn't needed, but dont I need a mechanical filter even with live rock? I think it should be alright for a BTA. I'm not sure about the clam. Maybe someone else can chime in. Also﻿﻿ I've gotten feed back that the penguin filter isn't needed, but dont I need a mechanical filter even with live rock? Power filters give you some more options. I'm not opposed to using them. However, you don't "need" a mechanical filter, although sometimes it can help. You're right, live rock provides a biological filter (the only required filter). Chemical and/or mechanical filters are optional (although sometimes beneficial). Are there specific corals that do a better job of filtering the bio load than others? If I just ran the protein skimmer should I add more live rock than the 15 pounds? Liverock is a biological filter but it doesn't reduce nutrient levels(nitrates and phosphates) to reduce those, popular methods are refugiums, filter media, waterchanges, and skimmers. Alot of us like running hob filters or media baskets in out aio's for carbon(removes toxins, clarifies water), filter floss(collects particles like poop and food). The biowheel on your filter can be removed, they aren't beneficial. Then you can use it for media. You can also add certain macroalgae's in the tank which will use the nutrients. Corals don't really reduce bioload. They use a certain amount of nutrients in the tank for survival. Are there specific corals that do a better job of filtering the bio load than others? Not sure that I know what you mean. Some corals that get target fed will have a higher bio-load than other which are primarily photosynthetic. And most corals will utilize some nutrients in the water for energy. However, in general, these are things that we don't worry much about. If I just ran the protein skimmer should I add more live rock than the 15 pounds? For a 28 gallon hex tank with a light-ish bioload, 15 lbs of live rock should be plenty. The old minimum of 1 lb of rock per gallon rule has been shown to be a little high. A protein skimmer won't help as a biological filter, but it will help export organics. I like using protein skimmers. For the lights the hipagiro one you showed would be a good budget choice. I believe it would have enough light for some deepwater clams like squamosas and derseras but those would get too big for your system. If you are dead set on the clam i would recommend getting something like a croeaca or maxima and blasting it with halides or a ecotech radion xr15. Clams arent chep in the long run because you either need a BIG tank or really high lighting. 15 pounds of liverock would be good and your fish stocking list seems great. But going soley by pounds can be misleading. 10 pounds of pukani is not the same as 10 pounds of soaked liferock you got from your lfs. very porous lr will actually help you reduce nitrates to a certain extent but i would not rely on that for your sole export. Personally i would run any hob filter (as long as it gets water through it its fine with me. With carbon, gfo, and some polyfill. 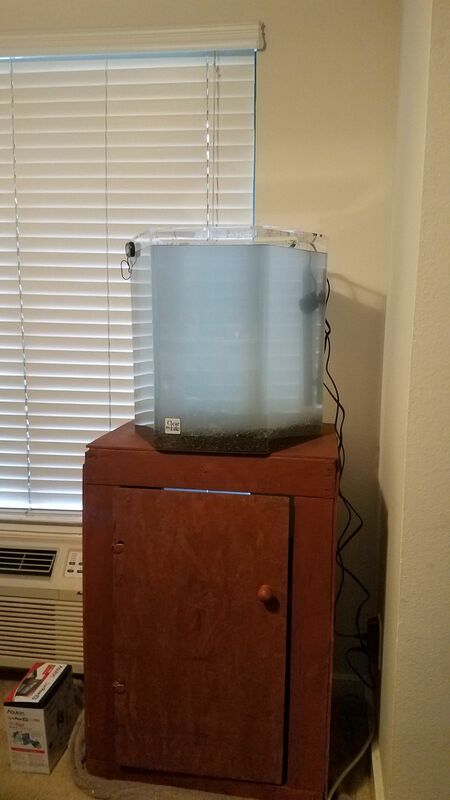 Simple but and effective way to postpone waterchanges. There are rumour that pulsing xiena actually consumes phosphates but i wouldnt trust those. If you want to reduce nitrates with something in the display i would use decorative macroalgeas. Thank you for your responses. I've realized that I need to return the penguin filter because it's not practical for me to have it run in the middle of the tank. It's the only way it fits since the sides of the hexagon width aren't bigger than 8 inches or so. I'm definitely not gungho about the clam, I just remember seeing them in Thailand and they are beautiful. I'm definitely more into the bubble tip anemone for the clowns since they are my foundational fish. I'll run both the macegrow and the hipargero and I think the two of them together should do the trick. Won't the shrimp, crabs, and snails munch up any macroalgae? I think I was confusing the carbon cycle with the nitrogen cycle when I wrote that. Won't the shrimp, crabs, and snails munch up any macroalgae? Not usually (maybe not always is better here). You'll find that (without tangs and other large herbivores) that you should be able to keep many decorative macro algae species (if you want). Thank you for all your help. Are certain macro algae better at fixating nitrate than others or is it pretty much comparable. I'm thinking seagrass might be the way to go since it will be low to the ground and won't block the bta or candy coral. Can I add the macro algae at the beginning of the cycling? Algae and seagrass utilize more nitrate than phosphate (consider the Redfield ratio). When looking at nitrate consumption, growth rates are probably more important than the ratio of nutrients consumed. I've found seagrass to be particularly difficult to keep in a reef environment. Die off can lead to excess organics in the required DSB and cause problems. Testing for and dosing nutrients is typically needed. Caulerpa prolifera looks similar to certain species of seagrass, and it can be kept in a shallow sand bed. It's also much easier to keep alive. Probably the most used macroalgae is Chaetomorpha (chaeto). It's not a decorative macro for your display, but it grows relatively fast and doesn't "go sexual" (break down and release spores when dying). It is usually grown in a refugium or a chaeto reactor. I got my tank finally. With 2 inch base of sand it has a volume of 24 gallons. So I'm thinking of doing the two clownfish and the one goby since it's about 4 gallons less than advertised. I will keep you posted in 6 weeks once it has cycled. Thank you for all your help. I know it's hard to tell because the water is cloudy, but do you have any rock in the tank?